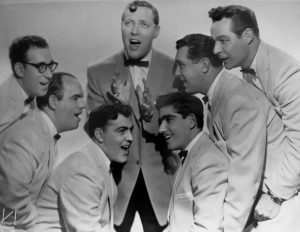 Synonymous with the Rock ‘n’ Roll era, Bill Haley & his Comets first broke into the UK singles charts in 1954, and in total had 199 weeks in the top 75. In that time they only managed one number 1, but their music is well known world wide. It features on film and TV soundtracks, and is often played at parties, even now over 60 years later. So where did it all begin? What are these amazing singles? Below is a list of some singles that broke into the UK charts and made Bill Haley & his Comets a household name. Shake, Rattle and Roll – hit the charts on 23.12.1954, its highest chart position was 4, but it managed to stay in the charts for 14 weeks. Not too shabby for a first release. Rock Around the Clock – The first and only UK number one single was released on 13.01.1955. It managed to stay at number one for five weeks, and had a total of 36 weeks in the charts. See you Later, Alligator – on 15.03.1956, this hit the charts and rose to no. 7. It managed to stay there for 21 weeks, but has remained a popular song ever since. Rock Around the Clock was re-released twice, once in 1968, and then again in 1974. Neither reached the heights of the original though, with the ’68 release only reaching no. 20, and the ’74 release reaching no. 12. There were several line-up changes for the group which remained together in one carnation or another until 198,1 when the group disbanded. However, their brilliant original music still lives on today, and their most popular songs are often included on compilation albums and are regularly played at discos or parties where they can really get people up on to the dance floor. Who would have thought that music in the ’50s would still be relevant today?